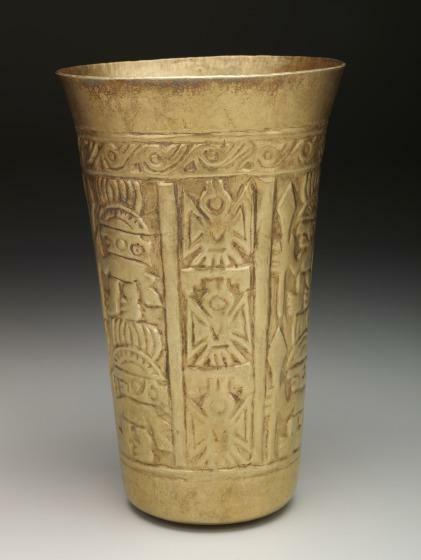 Produced for a Sicán high-ranking individual, this gold beaker resembles a typical Andean ceramic goblet, wooden quero (qero, kero) or metal aquilla. 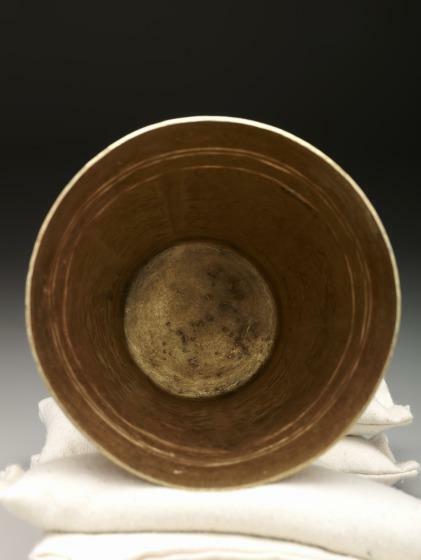 Through the Spanish Colonial period, these vessel forms were used in feasts for drinking corn beer, called chicha in Spanish or Taino or aqha (a’qa) in Quechua. 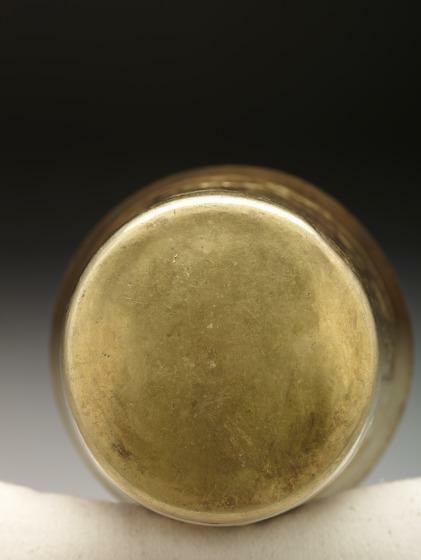 During the Late Intermediate Period (900-1400 CE), Sicán goldsmiths favored the use of sheet metal consisting of a gold-copper alloy; the copper provided for increased strength in sheet metal production. The artisans would work the sheet metal through annealing and hammering to shape the goblet form. Through the use of figural molds, the Sicán created low to high-relief designs on the vessel surface, which are visually enhanced through the play of light and shadow. The Sicán gold cups share highly consistent motifs. These include representations of bivalve Spondylus shells (1976.W.540). The Sicán elite may have exercised control over the trade of these precious pink to red shells, which occur principally in the tropical waters north of Peru. As regional descendants from the Moche culture, the north coast visual heritage is reflected through the illustration of plain and "animated" war clubs—weapons often terminating in a cone-shaped finial. 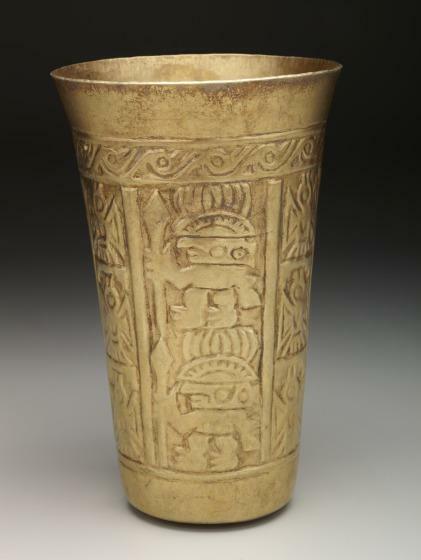 Other consistent figural forms depicted on these goblets include isolated anthropomorphic heads, staff-bearing individuals, birds, step-and-fret elements, and frogs. 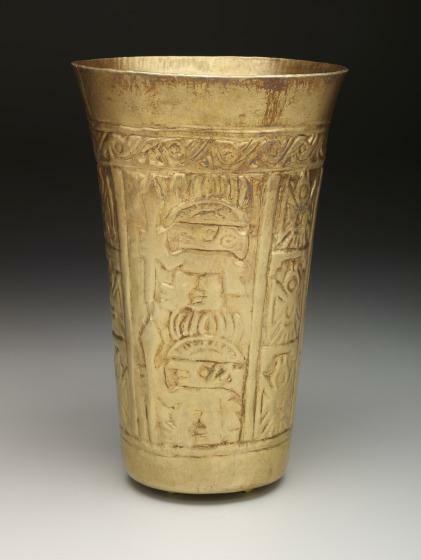 The repeated designs on these beakers suggest the creation of pairs for ritual feasts between guest and host, reinforcing the importance of feasting in pre-Hispanic Andean societies. Kimberly L. Jones, PhD, DMA unpublished material, 2015. Kimberly L. Jones, PhD, Inca: Conquests of the Andes / Los Incas y las conquistas de los Andes, Label text [1976.W.541, 1976.W.548, 1976.W.549, 1976.W.558], 2015. Bonnie Pitman, ed., "Group of Beakers (1976.W.545, 1976.W.556, 1976.W.542, 1976.W.540, 1976.W.570, 1976.W.562, 1976.W.569)," in Dallas Museum of Art: A Guide to the Collection (New Haven, CT: Yale University Press, 2012), 35. Carol Robbins, Label text [1976.W.540, 1976.W.543, 1976.W.546, 1976.W.547, 1976.W.550, 1976.W.551, 1976.W.570], A. H. Meadows Galleries, 2006. 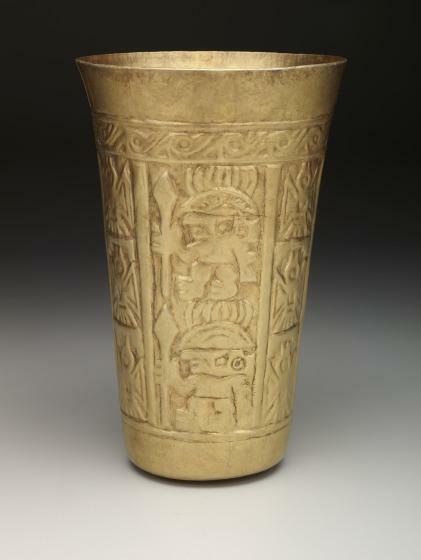 Sicán (Lambayeque) metalwork objects were regularly made in lots of 20 and 40, or in multiples of 20.